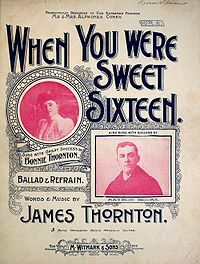 The first song to use the expression .. "When You Were Sweet Sixteen" by James Thornton, was published in 1898 but the expression was first used in print by poet Oliver Wendell Holmes (1809-1894) in his poem 'The Dilemma' in 1840. The poem follows later. At forks and around the bends. What happened to that funny face? And ten accused the darker hue. Give her blue eyes and golden hair. Came marching in, -- their eyes were blue. She looked at me; what could she mean? The victim falls, but knows not why. Though every limb were cased in mail. ...Sixteen years old with a pinch to grow on. ...I got somebody I want y’all to meet. Her name is ms. sixteen. She’s so young and so sweet. I guess nobody saw the bigger picture. Nobody cared that she would grow up and be bitter. ...But she was not...toys like Rubik’s cube and etch a sketch didn’t exist. Now you can start some nightlife. Sixteen, sixteen where have all those years gone? That thinks like that grandma and grandad too! but one things the same we are all in awe of you. we ask you to help us and you really don't mind. We really thought that you would get out of that bed. HAPPY 16TH BIRTHDAY TO THE GIRL OF THE YEAR! Really goes in a whirl. Is enjoy each and everyday! So there is no what might have beens. You are now old enough to think you're old enough! There is no other song to be sang for a girl! !